Barcelona's gentlemen crowned greats as FIFA's guttersnipes gun each other down. ﻿﻿﻿﻿﻿﻿At the same time, what started with Lord Triesman's complaints to Parliament over England's failure to win the 2018 World Cup bid has ended in disgrace and ignominy for FIFA. An extraordinary implosion has left Sepp Blatter as the only cowboy standing in the saloon bar shootout. The town ain't big enough for Mohammed Bin Hammam and Jack Warner. New Wembley's first European final was supposed to be between peers. Pep Guardiola and Sir Alex Ferguson, already previous winners were aiming to claim a fourth European Cup for their respective clubs. In the end, United were trumped as the Govanator was first to acknowledge calling the 3-1 defeat "a hiding". Because for all the tabloid headlines of drunken nights, love trysts and horrid WAGs, of bungs, dodgy expenses and allegations, it turns out winning can after all be achieved with grace, fairness, planning and hard work. Because Barcelona play football the right way. 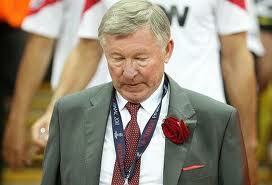 Another concession from the generous Fergie, who looked a forlorn figure at full-time on the Wembley pitch. Beaten thoroughly - every which way. Because though Wayne Rooney is a star player, he's not in the mould of one from Barcelona, where foundations extend way, way beyond the 90 minutes of game time. Rooney strayed from his Wembley instructions and Fergie bawled at him on the touchline for everyone to see. So incensed was the 67-year-old, it launched a bilious, coughing fit. Rooney to Barca one day? No chance. Because Puyol, already a world and European champion at club and international level, who came on toward the end of the game, ducked out of his role as captain in hoisting the trophy aloft, so Eric Abidal, who spent most of the season recovering from testicular cancer could have the honour instead. Mes Que Un Club and Football, bloody 'ell, you might say. ﻿And so to FIFA, where years of conniving and collecting dirt on each other is being mudslung for our entertainment. The headlines are set to be sponsored by Warner, who unleashing periodic nuggets to the media, he's dubbed a Football Tsunami. That he uses that word to describe his tittle-tattle is a measure of the man. An amoral urchin, who together with a generation of FIFA representatives are about to get their comeuppance. UEFA's been growing in status over FIFA for many a year. The formation of the Champions League was a masterstroke, acknowledging the growth of the European city states over their countries. If the 2010 World Cup threw up knackered horses in a steeplechase, this year's European Cup was one for the thoroughbreds. Now FIFA has no moral authority to govern the game as UEFA looks on at the top of the world game. Michel Platini constantly rejects the notion of standing for the FIFA presidency. Meritocracy wins the day. The start of a Football Spring? A club like Arsenal scour the world to find the best in football talent, so who would've Adam and Eved it that the solution to their goalkeeper and centre-back problem lay just a couple of miles from Highbury! 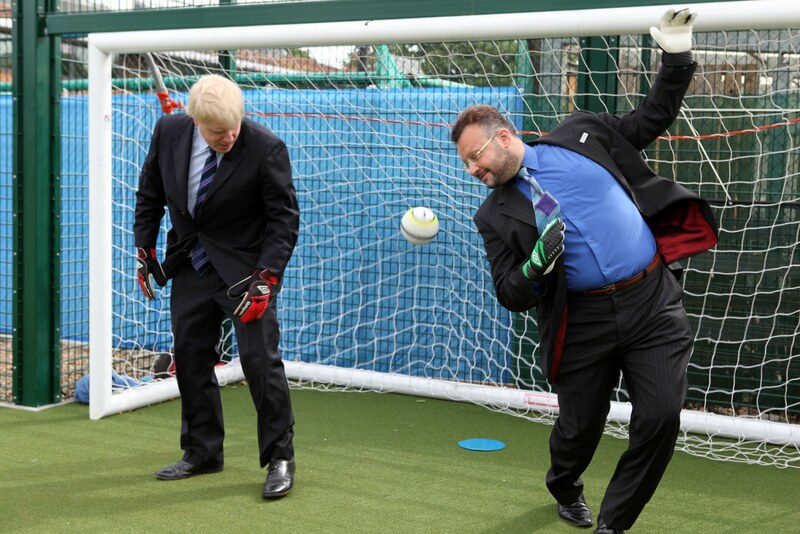 Here's Mayor of London, Boris Johnson and yours truly in the Outdoor Games Area of TreeHouse School for autistic children in Highgate, North London. It's a beautifully equipped school with 140 dedicated staff, looking after 80 children upto the age of 18. Believe me, the kids lives are transformed through this form of intensive education. Ken can't half hit them. 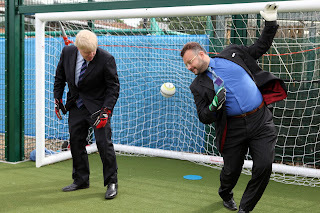 Note the assuredness, sheer majesty of girth and the suits that would grace any Cup Final day! Then the calamity of the defence breached from a set-piece. There were Arsenal community officers present. I'm sure whispers have reached the manager's office already. They've been conceding like this all season! Watching a demented Arsene Wenger patrolling the technical area at the Emirates on Sunday was to witness a man locked in a spent ideology. My frustrations really help put my boys at ease... not! In the latest instalment of Arsenal's self-destruct season, a 2-1 home defeat to Aston Villa, Wenger only succeeded in transmitting his own frustrations to his talented crop but they couldn't play for toffee because of it! And at six barren trophy years and counting, Wenger must adapt or die. With Manchester City en route to third place and the final automatic Champions League place, the barking Alsatian's piled still more pressure on himself at the start of next season. The Gunners will have to fit two more games into their early season to confirm qualification. A place at Europe's top table was seemingly an Arsenal rite but as Liverpool have found out, not anymore. 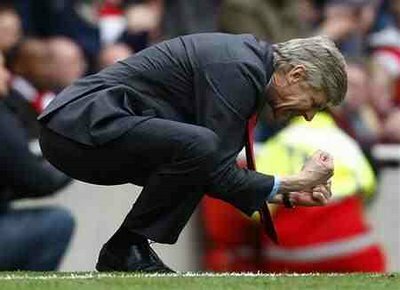 So Wenger needs to take a long hard look at his ideals and change; his attitude to the transfer market and his ways of looking at his own players. By signing Jens Lehmann and Sol Campbell, it's as if Wenger wants dependable old generals in the dying embers of their careers, so as not to upset the development of his classy youngsters. It's too easy this, fitba' bloody 'ell! Trouble is, his classy youngsters aren't all that. Gone are the born team leaders; no Vieira, no Adams, no Henry. Instead we're left with fine young talent, none of whom assume the alpha male leader's role. They're like Yorkshire terriers dribbling the ball round in semi-circles with their noses. Scott Parker mightn't be a classic Wenger player, but he'd inject craft and experience into the Arsenal midfield. I'm sure Darren Bent would've been the focal point of many Arsenal goals from January onwards and probably a title tilt too. Put it this way; when November comes, if the Gunners aren't in every competition and challenging for the title, then the new owner, Stan Kroenke will be taking a long, hard look at the manager. Wenger needs only to look at another great boss, Sir Alex Ferguson. His generations of teams are pragmatic enough to win titles and cups throughout time. I mean, would a Roy Keane, Steve Bruce and Eric Cantona be part of today's quick, fit and mobile teams? I contend not. Fergie moves with the times, even accepting that player's mentalities are different to how they used to be. David Dein believes that every manager has his shelf life. Now that Arsenal has changed again, is Wenger willing to change with them? Second guessing Queen's Park Rangers' fate. As QPR face Leeds United in the final game of their Championship-winning season, we're still no nearer knowing whether they'll be playing in the Premier League next season. Despite the transgressions of West Ham, who it was decided had benefited from the purchase of Carlos Tevez at the expense of Sheffield United, there's no precedent for the alleged transgressions that Rangers have committed. QPR are promoted as champions and will be awarded the trophy today, but face seven charges relating to the £3.5million registration of midfielder Alejandro Faurlin in 2009. The club deny everything. They're represented by Ian Mill QC, who acted for the Blades during the Tevez affair which saw the rules on third-party ownership clarified. The four-man three-day hearing began at Wembley on Tuesday and it's impossible to guess the outcome of their decision. So I'm going to try. The verdict was supposed to be delivered yesterday, but I think by delaying it they're boxing clever. Faced by Mill, the QC with the fearsome reputation and the combined ownership of Bernie Ecclestone, Flavio Briatore and Lakshmi Mittal, the Commission needn't draw on anything similar previously and can be seen to look tough without materially changing QPR's promotion. Therefore, I predict a points deduction which keeps them above third-placed Cardiff, and a six-figure fine. It'll rob them of the title but won't stop the promotion party. The playoffs won't be moved and life will go on. Governing bodies are running scared in the era of multinational ownership, financial muscle and legal henchman, and this affair will no different.